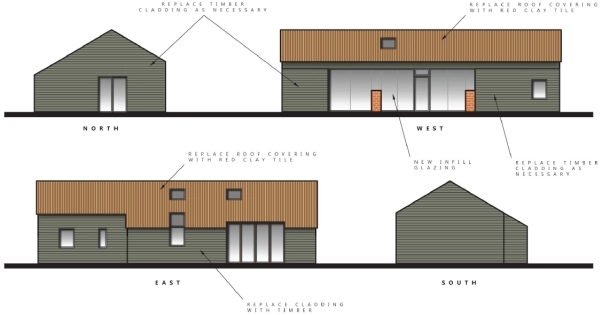 West Berkshire Council: Pure Town Planning have successfully negotiated a permitted development proposal to convert a barn into a house through the rather tricky “prior approval” system in a rural location near to Newbury in Berkshire. The agricultural to residential conversion permitted development right, introduced in April last year, has been notorious for the high percentage of prior approval applications which Council’s have turned down. Eventually the Government took the unusual step of issuing further guidance in order to try and clear up some of the worst ambiguities or misinterpretations of the legislation. We were approached to look at using the permitted development right on this attractive if slightly ramshackle timber-framed barn. We thought it seemed worth a try, because without the permitted development right there would be zero chance of obtaining a new residential dwelling in this countryside location. So we made the case and produced plans ourselves including these illustrative elevations. Our first attempt was turned down on a series of technicalities – frustratingly these could all have been cleared up if the Council had simply communicated with us prior to refusing it. Following this we made sure all matters were resolved before submitting the second application and this time the Council issued a notice to say that prior approval was not required – which means that the proposal can commence forthwith. It is interesting to note that whilst prior approval was not required the legislation still requires the development to be carried out in accordance with the prior approval application, also now the development must be completed (not just started) within three years of either prior approval being granted or a notice indicating that prior approval is not required. If you have an agricultural building which you think might be capable of conversion to a residential dwelling then why not get in touch with Pure Town Planning?